Get a shirt. Keep Hostel Detroit going. All proceeds go toward our building renovation fund and we will even ship it for free. Get your hands on one of our brand new limited-edition, hypebeast, super cool, rare, and funky Hostel Detroit t-shirts! Unisex sizing. Only $30 shipped! Designed and screen printed in Detroit, our shirts feature the infamous Michigan Central Station. These shirts make GREAT holiday gifts! Please select your shirt size! 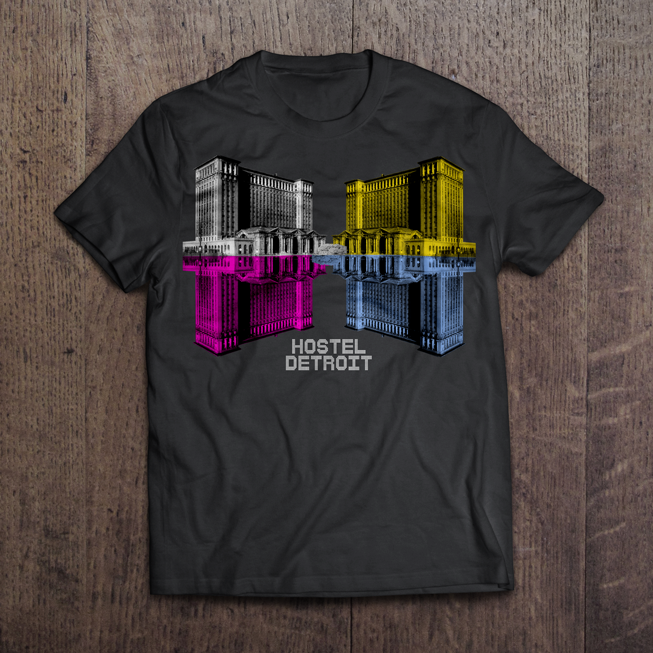 Get your hands on one of our brand new limited-edition, hypebeast, super cool, rare, and funky Hostel Detroit t-shirts! Unisex sizing. Only $30 shipped! Designed and screen printed in Detroit, our shirts feature the infamous Michigan Central Station. All proceeds go toward our renovation projects and they make great holiday gifts! No thanks, but I would still like to donate.